When the latest Spotlight Series Tour, featuring New York Review Books Classics was announced, I looked through the publisher's catalog to see if any book jumped out at me. I love the idea being the Spotlight Series Tours, which is to draw attention to small press publishers and their books. They often don't have the money or the resources to advertise the way bigger publishers do, and so their books go unnoticed. 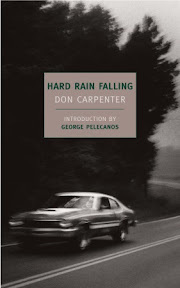 I was drawn to consider Hard Rain Falling, Don Carpenter's first novel, for two reasons: the title and the fact that author George Pelecanos went so far to say the novel "might be the most unheralded important American novel of the 1960's." And, after reading the description of the novel, my interest in it was more than a little piqued. Don Carpenter’s Hard Rain Falling is a tough-as-nails account of being down and out, but never down for good—a Dostoyevskian tale of crime, punishment, and the pursuit of an ever-elusive redemption. The novel follows the adventures of Jack Levitt, an orphaned teenager living off his wits in the fleabag hotels and seedy pool halls of Portland, Oregon. Jack befriends Billy Lancing, a young black runaway and pool hustler extraordinaire. A heist gone wrong gets Jack sent to reform school, from which he emerges embittered by abuse and solitary confinement. In the meantime Billy has joined the middle class—married, fathered a son, acquired a business and a mistress. But neither Jack nor Billy can escape their troubled pasts, and they will meet again in San Quentin before their strange double drama comes to a violent and revelatory end. Hard Rain Falling reminds me of American Rust by Philipp Meyer in some ways. The overall mood of the book is dark and, well, sad. Too, there is that immoral ambiguity which runs through it. There is a hopelessness there but also a sense of hope. The characters always seemed to be seeking redemption or a better life only to be dragged down by circumstance or their own choices. The major and minor characters in the novel all felt trapped and longed to be free. Jack was not a character I liked all that much, I confess. I felt sorry for him, but I had a difficult time relating to him. He was tough and angry, a product of his environment and the lack of love he received as a child, having grown up in an orphanage. He was quick to temper and egocentric. Not really surprising given his young age throughout most of the book. He does grow as a person over the course of the book, looking inward and trying to find the meaning in life--in his life. From Carpenter's words, the sense of longing and frustration Jack often felt was palpable. Billy Lancing, on the other hand, was a different story. I liked him from the start. He was sharp and honest. He had an uphill road to travel most of his life, facing prejudice and being out on his own. His story, especially, was heartbreaking, seeing him succeed only to land in prison. Then there was Sally, a woman full of ambition and life, who began spiraling downward at breakneck speed. It was hard to watch that happen. I was swept up in the story immediately, caught up in the story of Jack's parents, but the story began to wan for me in part three. While Jack was struggling with big questions, I grew a little weary of his inner monologues and longed to get back to the "action" of the novel. Don Carpenter's novel takes the reader into the pool halls of Portland, Oregon to the streets of California and into the jail and prison system. He paints a harsh reality of life and society, both human nature and systematic. I can see why Hard Rain Falling is thought to be a novel of its time, capturing the feel of the 1960's so well. While some of the ideas and language used is clearly dated, the novel is still just as relevant today. To see what other New York Review Books Classics bloggers are reading for this Spotlight Series, check out the Spotlight Series blog. I'm wondering how they end up in San Quentin. I'll have to keep this one in mind. Thanks for the review. I'm glad you enjoyed it! I've never heard of this one before. Hi Wendy, I have yet to read AMERICAN RUST but it's definitely in the plan to do so soon. This one sounds like something I'd read too so I'm going to put it into my wish list. As always, I love your reviews! One of my choices for the series also had a lot of internal monologue and it was EXHAUSTING. I don't know if I was smart enough for that story! I am glad you chose one that you were able to compare to other books you've already read- I love when that happens. I do often find that internal dialogue can be whiny. I'm sure if someone had access to mine, they would find it whiny too! It can wear you out to have so much of it in a book. I don't blame you for giving this one a try though. I love Pelecanos. I don't mind dark, dreary books, but do need some lighter fare between them. This sounds interesting. Anna - Jack's always seems to find trouble and has little regard for the law. His ending up in prison wasn't so surprising as it seemed like the direction he was headed early on. Billy's path was a bit unexpected. It's definitely an interesting novel. Chris - I hadn't heard of it before finding in the publisher's catalog either. And while I didn't love this book, I am glad I read it. It definitely is a worthwhile read. Alice - American Rust is such a good book. I hope you do enjoy it when you read it, Alice. Aarti - I know what you mean. I wondered if perhaps I wasn't completely in the right place to be reading this one when I did. Or at least that third part of the book. The internal monologues didn't quite gel with the feel of the rest of the novel. At least in my mind. Still this was a worthwhile read. Very interesting. Sandy - Oh, I know! LOL I think I'd drive anyone crazy with the thoughts in my head. I don't think Jack's internal monologues were all that whiny--just long winded. Most of the book was monologue free, which made it stand out for me in part three. And I think the author got across his point well without needing to get so much into Jack's head. It was like he pulled out his pedestal for that section of the book so he could make sure the reader didn't miss anything. Kathy - I'm like you. I do like reading books that are dark and dreary from time to time, but mixing in lighter or happier fare is necessary too. I'm feeling like something light is in order after reading this one. I'm glad you found this worthwhile, Wendy, even if it didn't become a new favourite. I wish I'd had better luck with my selection. But I'm definitely interesting in reading more NYBR Classics in the future. Ana - There were several other NYBR books that caught my eye but I avoided choosing them because I figured they'd make everyone else's list. I'm sorry your pick wasn't better. It sounded so good from the description. This one sounds appealing to me. I liked American Rust even though it did make me sad. And I like that this one is set in Portland, OR since I am familiar with that part of the country. Great recommendation, thanks! I wasn't that crazy about American Rust, but this one sounds as though it might be more to my liking. I like that the characters are conflicted and multifaceted and am going to be adding this one to my list. Thanks for the spectacular review!! Oh I like the sound of this one. I've read just a few NYRB books but wouldn't you know it, some of those have ended up on my favorite reads of the year lists! I don't know how I'd missed the spotlight on series but what a great idea. Kathleen - American Rust was so good. I am often drawn to sad books. I'm not quite sure why. Maybe something to explore someday. Zibilee - I think you might still like this one. It's different from American Rust in many ways, including writing style was. The two just kind of reminded me of each other though because of the similar themes. The characters definitely are multi-layered and conflicted, which I think adds to the books charm. Iliana - I really like the idea of the spotlight series and am glad I was able to participate this time around. I'm not sure I'll be able to next time, but we'll see. As far as I know, this was my first NYRB book. I do hope to read more published by them. It sounds like they have quite a diverse collection.